Like most of David Colosi’s analytic and/or narrative projects, his new installation at Galerie Catherine Bastide begins with a found object. Over ten years ago, he found a signed copy of Dr. Jacob Buckstein’s Annals of Roentgenology, Vol. X: Peptic Ulcers in the trash, and he has been obsessed ever since with the x-ray images contained within. His interest is not in the ulcers, but in the arrows that indicate them. Lay people looking at an x-ray, although they do not know what it means, at least know that it is telling them something important, and in many cases their lives depend on the information. Without medical knowledge of the internal body, most people cannot read an x-ray without the interpretation of a doctor. If there is a textual interpretation it is often in an esoteric medical language that is just as inaccessible. By drawing these x-rays out of context and drawing attention to the arrow and its semiotic nature, Colosi’s installation as a whole takes on some similar qualities. 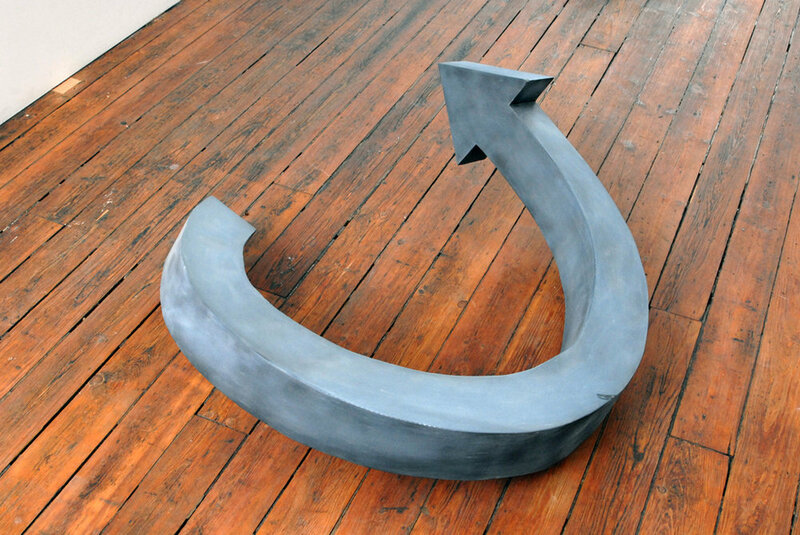 Sculptural arrows become signs at rest or in wait just as traffic signs would appear in a junkyard or store. Pointing at once to their past context and/or to their future function, the present arrows stand alone. Yet by its construction an arrow always forces one to turn towards that which it points at. Its physical make-up makes it invisible by deflecting its presence. Both Colosi’s title and the installation, like an arrow, indicate evidence of a past performance while anticipating a book to come. The installation becomes a thick present that points to evidence of an inaccessible past and future but insists on an interpretation of only what is physically present. On opening night, an intimate audience will be invited to participate in the final stage of the creative process. Min Tanaka once described Tatsumi Hijikata’s performing body as “a weapon, like a knife…He was always attacking the audience.” While Colosi’s body will be an arrow, the attacks will go both ways. Rotten tomatoes will be provided, but viewers are strongly encouraged to bring their own. 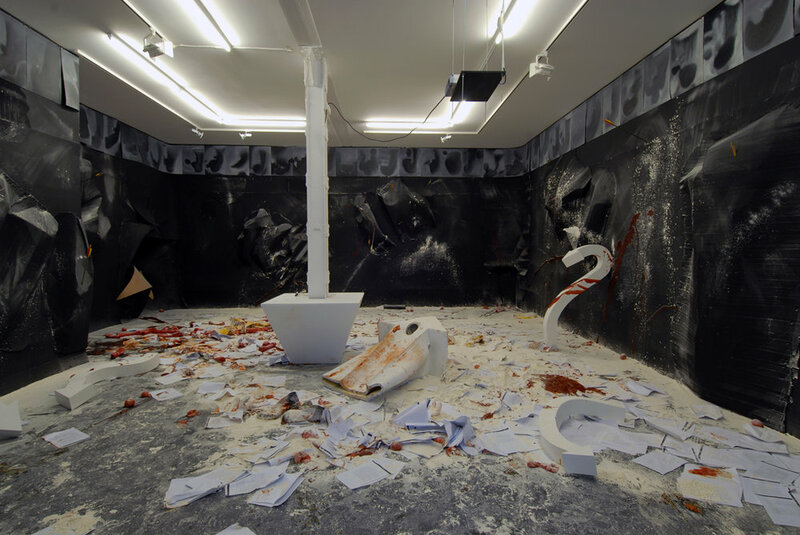 Mixing inspiration from Ankoku Butoh, Peter Greenaway’s film The Belly of an Architect, Bruce Robinson’s film How to Get Ahead in Advertising, and vaudeville audience criticism, the black box gallery becomes both a stage of “utter darkness” and the inside of an x-ray of a stomach. The ulcer x-ray drawings line the upper walls of the gallery. 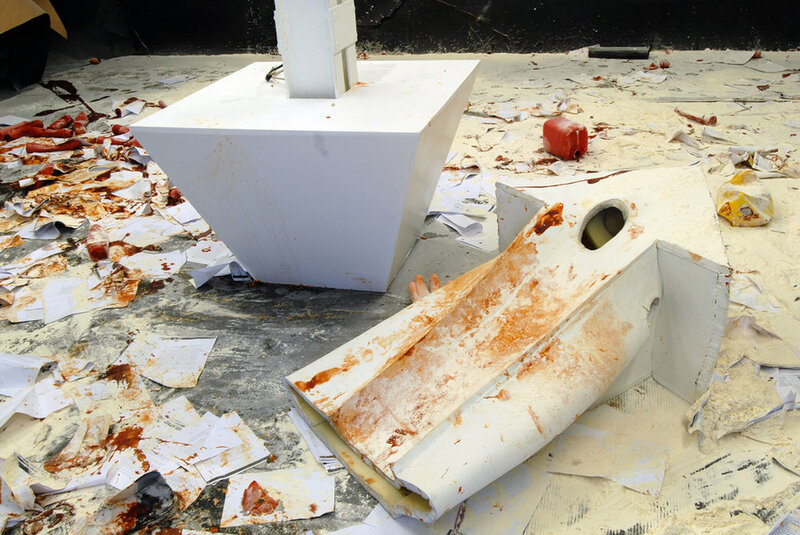 The stage/stomach/gallery comes alive with tomatoes, ketchup, flour, and “wounds” as a personified arrow enters in the grips of an identity crisis. Dreaming to no longer point at This, That, and the Other, the frustrated arrow attempts to point at himself. 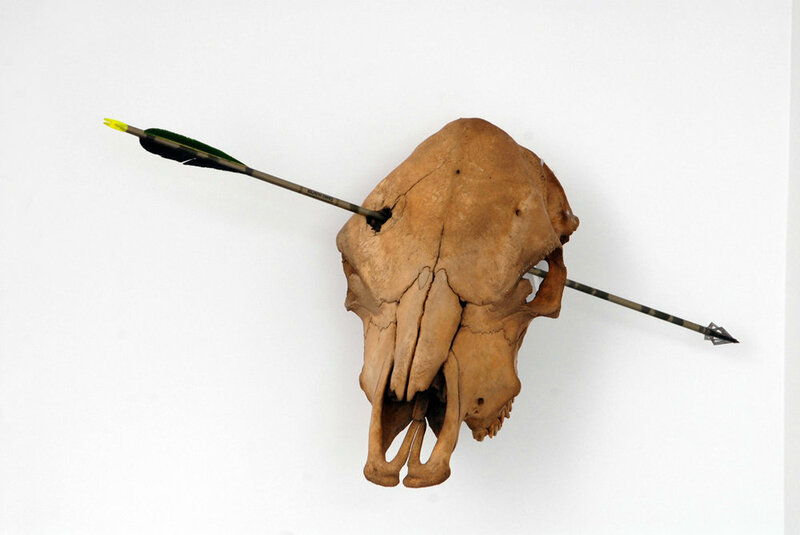 Recognizing his invisibility as an indicator and envious of the physicality of the archer’s arrow, he dreams of his own flight into physical Being. Ironically, inadvertently, or the product of wish fulfillment, at the moment he is swallowed in the stomach he achieves his goal. The foreign object becomes the cause of the ulcer, and, by association, requires another indicator arrow to identify it. Upon this realization, the arrow molts and metamorphoses. His skin is left behind, and he ascends the stairs (the gallery’s esophagus) and becomes digested into the head. The upper gallery is a clean “exhibition ready” space showing objects and drawings of x-rays of individuals who have had foreign objects shot into and through their heads. 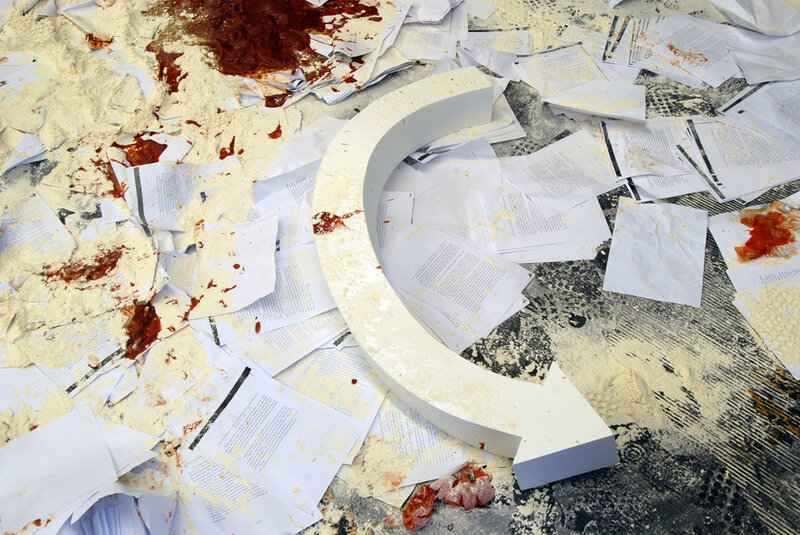 Following the performance, the space will remain “as-is” to constitute the final installation.